According to recent filings with the FCC (Federal Communications Commission) in the USA from The Walt Disney Company made on January 21st, 2016, the internal electronic components of the MagicBand are about to get an update. The filing for the new model of MagicBand, labeled Q3E-MB-R2G1, has some details about what’s new, but also hides some information that could prove to be intriguing… or not. There isn’t much information on the new model, but from what I could find shows that the power output of the new MagicBand will be higher than the current one, using 960.0 μW (microwatt) up from 686.8 μW. This could indicate improved communications with touch points and/or long-range sensors. A previously certified wrist band (FCC ID: Q3E-MB-R1G1) that contains a proprietary DTS radio. This product model [Q3E-MB-R2G1] is a slight modification from the previously tested model. The flexible printed circuit has a minor modification and the plastic outer shell has been modified to improve wearability. No electrical functional changes have been made from the previously tested model. The Walt Disney Company specifically requested that pictures of this new model and the user instruction manual not appear online to the public until July 19th, 2016. That could indicate changes to the design, but it could also mean nothing, as maybe the internal components are the only thing changing. 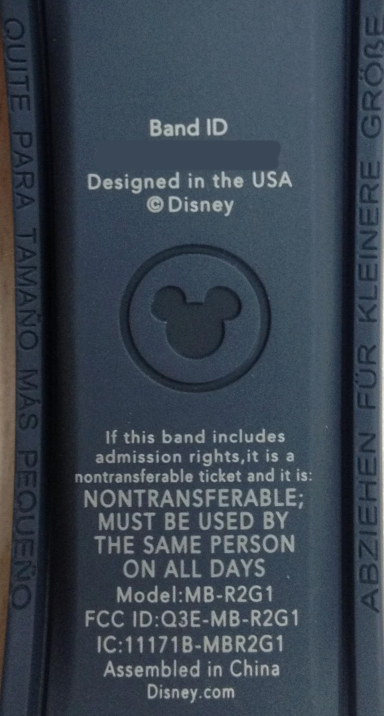 I wouldn’t expect a major external change to the MagicBand, as implied by quote above. It’s most likely just referring to the new slightly thinner and more flexible design just recently released to the public, although it currently still contains the first generation electronic components inside. 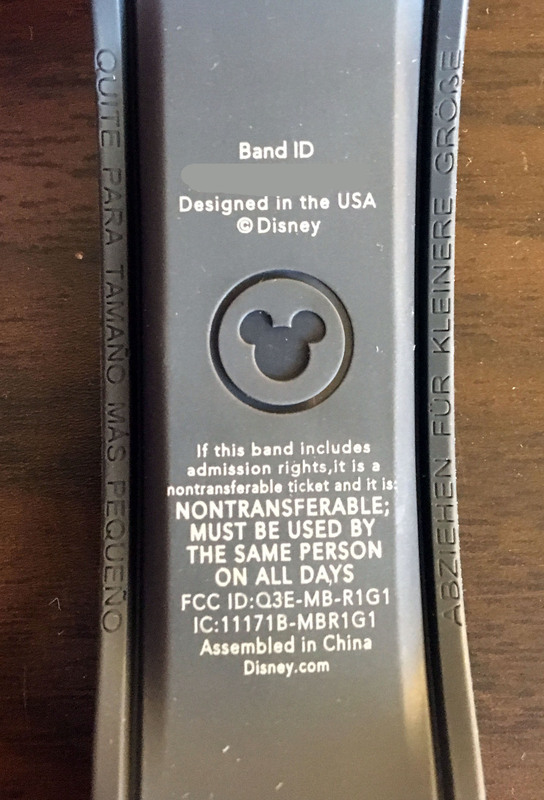 The current model of MagicBand out right now for public use is Q3E-MB-R1G1, and you can see that number clearly on the back of current bands. The IC number on the back stands for Industry Canada and is their specific ID for their communications device database. 12 Responses to "MagicBand internal electronic components to get an update soon"
I hope they go ambitious with the Bands potential capabilities. My initial idea would be aggregating all the bands in a line to calculate line times in real time, developing crowd control methods based on the paths guests take after events like paraded & fireworks, maybe even amount of riders waiting at a specific bus stop leading to putting more buses on that route to handle demand. They could get very innovative if they chose to. I hope they go ambitious as well! But I do know many plans in the past with MagicBands have been put on hold due to budget problems and questions about ROI. They were supposed to rollout MagicBands to the Disney Cruise Line to all guests, and that never happened, and many in-park interactive queue features were cancelled as well, including a special interaction on the Expedition Everest ride in Animal Kingdom that I was told was coming over two years ago. I feel as though there has been a significant slowdown in the MyMagic+ rollout and enhancements as Disney shifts focus to new lands and rides to compete with Universal Studios and tests the waters in technology with the Shanghai Disney Resort. That’s not to say that’s a bad thing (I want new rides and lands!) but that maybe we’ll just have to wait a while longer for any major enhancements. But will purple become a standard issue color, or remain a color only for purchase? No idea. Disney is obviously arbitrarily holding purple back from being free so they can make more money on people who want to buy the color. It could last forever that way, who knows. Not real happy with Disney right now. With all the money they make they still raise prices. Walt’s dream was for an affordable place where families could go to have fun!! Anymore Disney is to expensive for families to get in the parks even for one day!! So sad!! I’m sorry you feel that way, but what does that have to do with the MagicBand internal components? This is just a fan-made site and not run by Disney. I have “heard through the grapevine”, future bands will light up and be rechargeable. Clearly this is not 1st hand knowledge so take it for what it’s worth but comes from pretty good source. Anyone know why disney would get an canadian certification? My guess is so they can ship them to Canada for resort guests (eventually, if they don’t already do that). It’s probably required for shipping electronic good into the country. I’m confused- are the bands people buy in the stores supposed to be used for park-related things, or are they like “dummy bands” that are meant to be worn/collected just for fun? Or both? I always want to buy them because some of the designs are awesome, but if they are for park use, I couldn’t see a reason to purchase since I dont make it out to the park very often..